●What is Information & Strategy Office? In severe financial conditions, many municipalities are attempting to focus on policies for the efficient and effective financial operation. What is the necessary policy for the social and economic development? Municipalities are also expected to engage in marketing. The ‘Information & Strategy Office’ was set up in URC (Fukuoka Asian Urban Research Center) as an advisory team serving for Fukuoka City with a mission to contribute to the economic growth of Fukuoka City. In daily operation, it collects and analyzes data and information, consults to city bureaus and the general public, builds up policy options and recommends priorities to support Mayor’s decision making. we would like to introduce the data indicating the global position of Fukuoka. We hope this series will be useful to boost the presence of Fukuoka City in the global economy. 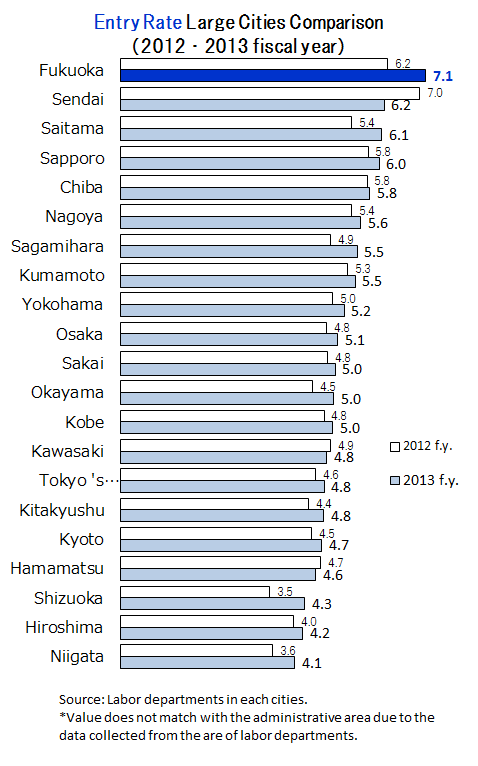 Last year, “Fukuoka Growth – Growth Potential of Fukuoka City –” provided information on the domestic growing strength and the advantages of Fukuoka City on the basis of the related data. This year, we extend to share information under the name of “Global City Status” so that Fukuoka City could enhance its international presence. As announced by Cabinet Office in July, due to the “Abenomics” effect, Japan’s economy seems to be recovering, which is seen in a variety of matters such as GDP growth rate, overcoming deflation, and employment conditions. Especially in Fukuoka City, an increasing volume of data indicating “increase” or “uptrend” for a variety of index is found over these few years. 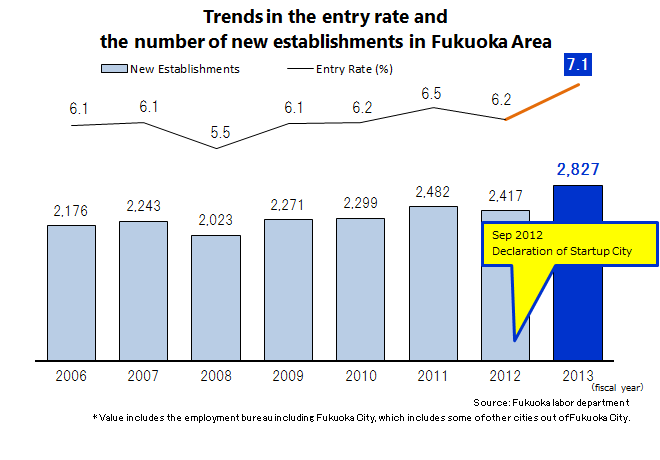 The number of new establishments was 2,827 in 2013, increasing from the closest average number of establishments by 428. It has become the largest number of business establishments over the past 10 years. Subsequently, the business entry rate was 7.1%, rising 0.9 points up over last year, and has become the 1st ranked city among major large cities in Japan. The economic ripple effect caused by this additional establishments (428 new establishments) has become approximately 42 billion YEN (estimated), which enables us to predict the stronger prospect of “Startup City”. Additionally, a variety of promising signs in economic field such as increasing number of employment insurance certificate holders by more than 10 thousand people over last year, improvement in the vacancy rate of office complex and growth of the hotel occupancy rate, has started to be seen. These upward streams are expected to bring synergetic effect by involving others around and utilizing the special zone scheme for global startup and employment generation, and also to lead the whole region to grow substantially.